Evolution. Everything that wants to survive and thrive has to adapt to its environment and evolve to an ever-changing landscape. That statement is not only metaphorically accurate for Las Vegas but is simultaneously literally accurate. This week’s winner from @classiclasvegas gave me an experience I’m unable to recall ever having before in relation to photography of my favorite city, disorientation. Never has something so familiar looked so foreign to me. 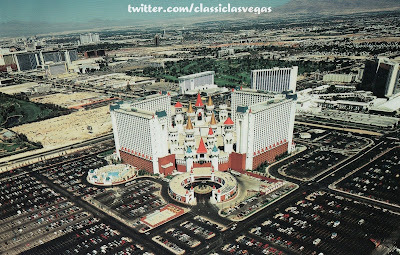 In 1990, when Excalibur opened, the largest hotel in the world at the time, it was basically on an island. True Tropicana was next door to it and the Hacienda just south of it but next to the shear size and scope of the Excalibur project, those properties look out of place in comparison. In 1990, there was no MGM Grand, just the Marina hotel that it would eventually become consumed and incorporated into the project. 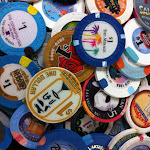 There was no NYNY or Monte Carlo just the Dunes golf course. No Paris, an unrecognizable version of the Aladdin and that was about it until you got to the corner of Las Vegas Blvd and Tropicana. In 1990, Excalibur looks as out of the way then as Stratosphere does now. This was a time when the strip still looked like it was an oasis in the desert. Once again, photography has given me the best of both worlds. I’m able to enjoy watching the evolution of the strip while making me grateful I didn’t have to experience it.